Did You Walk or Cycle across Skinny Bridge when in Amsterdam? Walk or cycle across Skinny Bridge at least once during your visit to Amsterdam. At night, when 1200 lights lit up, Magere Brug is magic and the best place to snap a photo. Of Amsterdam's fifteen hundred or so bridges, Skinny Bridge is probably the best-known and most photographed in the city. It makes for a romantic evening walk, when the twelve hundred lamps that festoon the bridge lit up. Go Dutch, rent a bike and cycle across. Summer is the best time to ride a bike, but the Dutch pedal away in any season. Do you want to snap that authentic Amsterdam photo? Skinny Bridge is a favourite stop for conducted cycling tours. Their red or yellow bikes bring colour in your picture. Snap tourists but above all Amsterdamers riding across holding up umbrellas when it rains, pedaling away in tight skirts or back passengers sitting on the luggage rack. Would you make it a point to cross Skinny Bridge when visiting Amsterdam? For sure I would want to do the Amsterdamer thing. The only way to experience a country! 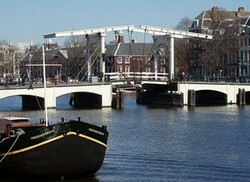 Magere Brug or Skinny Bridge spans the Amstel River, and connects Kerkstraat with Nieuwe Kerkstraat. Legend has it that in the seventeenth century two wealthy sisters lived on opposite sides of the river. Fed up with the long detour when they wanted to visit each other, they had a bridge built. Their family name was Mager which translates as skinny, hence Magere Brug. However, it is more likely that the bridge got its name because it was so narrow that two pedestrians could hardly pass each other. In the eighteenth century the bridge was widened to a double bridge so that two span of horses could pass each other. It was replaced twice in the twentieth century. Each time the architects did not change the original wooden design. Today the bridge is pedestrian and cyclist only and the most photographed bridge in Amsterdam. The Amstel River is a busy stretch of water. Magere Brug opens frequently to let the barges and boats. Pedestrians and cyclist waiting patiently for the bridge to close again are your best photo opportunity. Magere Brug connects the canal district with the former Jewish Quarter where you can find Waterlooplein flea market, the Portuguese Synagogue and the Jewish Museum. The bridge is the best spot for taking photos of the Hermitage Museum. The next bridge, Blauwbrug, is the best place for photos of the Stopera, theater, opera, concert hall and town hall combined. Did you take a photo of Skinny Bridge? 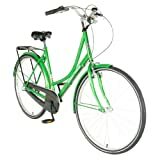 Feel like a local and rent a bike. Pedal along wine-red bike lanes, negotiate humpback bridges and navigate your way down narrow lanes. Amsterdam is a truly bike-friendly city. Most Amsterdamers possess at least one bike. You will see bikes everywhere; parked against walls, chained to bridge railings and lamp post. Toddlers to grannies, bank managers in three piece suits, mothers in tight dresses, everyone moves about on bikes. Many outlets rent bikes. The most touristy is MacBikes with two locations: Stationsplein 5 and Nieuwe Uileburgstraat 16. Their bikes have a big red and white MacBike sign and everyone can see that you are a tourist. Rent your bike from Yellow Bike, Nieuwezijds Kolk 29 and you almost blend with the Dutch. A standard bike will cost €5 for two hours and €10 for twenty-four hours. Pedal away on your own Dutch bike for the authentic Amsterdam experience. For those who think the journey is half the fun. We would love to visit Amsterdam - thank you for the ability to view the beautiful photos. It sounds like you are living such a wonderful life, following your passions and traveling about...if only our RV could float across the oceans, so we could see the places we've only dreamed about! The Dutch almost learn to ride a bicycle when they are still babies. Riding a bike is a skill for life. That may be the reason that there are few accidents, add to this the very good bicycle paths and you have the ideal circumstances for pedalling away. Cheap trains connect Eindhoven Airport to Amsterdam. Spend the night in one of Eindhoven's budget hotels if you have an early or late Wizzair or Ryanair flight.